Yesterday during a walk at Long Hill Gardens, I saw a few crocuses and some little yellow flowers, just like these, starting to appear. I took a picture with my phone cam, but the flowers were still too few and far between to make a good photo. (The recent snow and ice storms have slowed the arrival of spring.) Tonight I looked through my old photos and found a picture of the same little flowers, taken about the same time last year (March 29)! 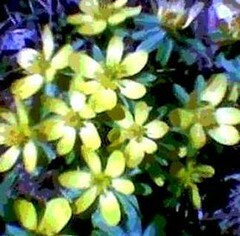 The picture was taken with my old phonecam, so the image was small and slightly blurry, but it had lots of the little yellow flowers, and I liked the composition. I resized the image, increased the saturation, and then posterized it in Painter IX. Maybe this is rushing things, but I am more than ready for spring! 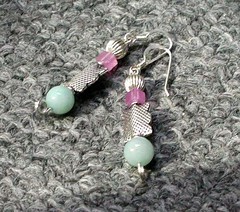 These are earrings that I made and recently sent to my friend Sandra for a birthday gift. Tomorrow she and her daughter will leave San Diego where they have been visiting to return to Brazil, so I called today and talked to both of them on Skype. These days, with the internet, distances seems less daunting. But when Sandra and Rene left Boulder to return home to Brazil so many years ago, I didn't think I would ever get to see them again because the distance was so great and the trip was so expensive. But now, here we are, still friends after almost forty years! And although we don't see each other often, we do see each other from time to time, as with my recent trip to meet Sandra in San Diego. But even when we can't get together, we know that geography has nothing to do with friendship and that love has always been stronger than time. This morning I went to Red Brick to make this little drawing, using conte crayon and pencil over acrylic on paper (in fact, an old painting of mine that I had cut into nine pieces). 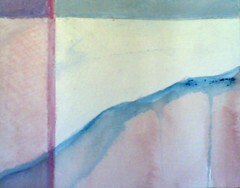 This is the ninth and last drawing in the set of small landscapes, three vertical and six horizontal. 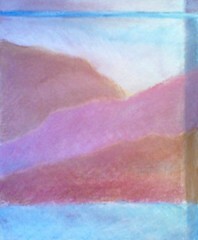 I enjoyed making this drawing, especially because the colors remind me of Colorado, my home state. Now I have the set of all nine transformational drawings pinned up on the studio wall, and it is fun to look at them all together. It is always a little scary to me to cut up an old painting to try to make something new. Transformation is always hard, but now I am happy with the result. 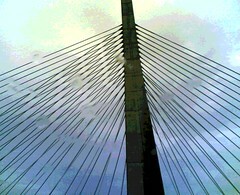 Yesterday I posted the posterized version of this photo of Boston's newest bridge. Here is the original photo, just as it came out of my phonecam, including the raindrops on the car window. Which version is better? Tonight I came across the photos I took on a recent trip into Boston, and found another photo of the Zakim Bridge. I love that bridge, but even when I have the chance to be a passenger so I can take pictures, it is hard to get a good photo. But I keep trying! In this case, I used my phonecam to take this photo from the passenger's seat of my daughter's car, through a rain-splattered window, looking right up at the bridge. I was interested in the angle, the pattern of the cables, and the pattern of the raindrops. I posterized the photo to see what it would look like, and here it is. But I like the original version too, so I will post it tomorrow. This image began as one of the photos I took last week with my phonecam during an early morning walk. When I was taking the photo what I noticed was the way the sun looked through the woods. What I didn't notice was that the snowbank in the lower right corner was typical March snowmelt, covered with accumulated mud and dirt from the street. But this was my favorite photo of the set, so I wanted to fix it. I tried cropping the photo, but that changed the composition too much. So instead, I opened the image in Painter IX and cleaned it up using digital bleach, followed by digital pastel. I only worked on the bottom right corner of the photo; everything else is just as it came out of my phonecam. Is this digitally modified image now further from reality, or closer to it? Well, it is certainly less "real" than the original photo, but in a way, it is truer to the way the scene looked to me when I saw the morning sun through those trees. We have had several days of warm weather (which north of Boston can mean anything above freezing), but the temperature has actually been in the fifties recently! But last night it started to snow around 10 pm, and it was a beautiful snow, with big, soft flakes. This morning I took some pictures with my phonecam because it was already getting warm (not freezing, I mean to say), and I knew the snow would disappear quickly. I was right (so no shoveling required!) Tonight I cropped this image from one of those photos, and decided to try posterizing it using Painter IX. I liked the effect because the posterizing shows off the texture of the heavy spring snow that coated the branches like frosting. Yesterday I made another of my transformational drawings. These are conte crayon and pencil over acrylic on paper. 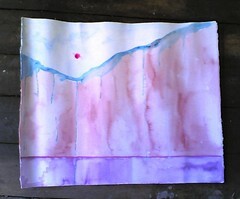 In this one, I was thinking about the color of the Colorado mountains at sunrise or sunset. I am going to make nine of these drawings, and there is only one more to go. . . . This is a drawing I made yesterday morning at Red Brick. It is one of a series of nine small drawings made on nine pieces of an old painting of mine that I cut up. 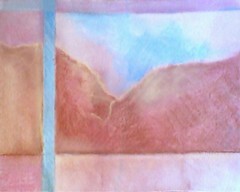 The original painting was the beginnings of a landscape inspired by the Colorado mountains. And in this little drawing, you can see part of the original painting in the vertical bar on the right-hand side. I draw the vertical and horizontal lines with pencil and T-square, and then draw into the image with conte crayon. I have had a lot of fun making these little drawings, and have pinned them up on the wall of my studio so I can see how they look together. The number refers to the position of the piece of paper in the original painting, but this is the seventh drawing I have done in this series. Just two more to go. . . .
Just yesterday, I was photographing Massachusetts snow scenes, so this picture of sunny San Diego is quite a change! Today north of Boston, the weather is suddenly warm, but not THIS warm. But I have been thinking about my recent trip to San Diego to see my long-time friend from Brazil and her two daughters. For the past few days, I have been editing photos and mailing them to my friends, who will be leaving San Diego and heading back to Brasil next week. My trip out there was very short, and everyone said three days is not enough time to see San Diego! But seeing San Diego was not the point; I went to San Diego to spend time with great friends who are usually half a world away! But in San Diego, we had time to shop and talk and laugh and cook together, and do all those things friends do easily when they live close together. We made the most of the time we had, and I really saw a lot of San Diego after all! Late in the afternoon of my last day in San Diego, we drove through Balboa Park. 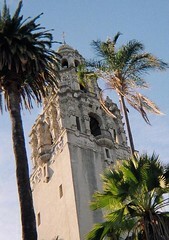 I loved the ornate buildings and the palm trees against that bright blue sky, so I took a picture. It's a nice souvenir of San Diego, but even better, it is a memory of spending time with friends. 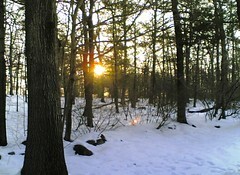 Yesterday I was out for a walk earlier than usual, and had a chance to see the early morning sun through the woods. (I guess daylight savings time has its advantages.) Anyway, I took some pictures with my phonecam. Some of the photos need editing, but I like this one just as it came out of the camera. This morning I went to Red Brick and made this little drawing. There will be nine drawings in this series, but this is not the last drawing even though this one is Number 9. (I still have three more to go.) The number refers to the position of the piece of paper in the original acrylic painting (cut into nine pieces). This one was in the lower right-corner, and you can tell because this is Arches watercolor paper, which has embossed lettering in the corner of every piece of paper. I struggled with how to deal with the lettering, and decided to encorporate it into the composition (as opposed to trying to hide it), but without letting it "take over" either. This created a problem, and made it more challenging to get the composition and colors right. One of my college painting teachers, Robert Daigle, taught us that in art it is good to have a problem to solve. I thought about that this morning, because I had to work hard to make this drawing work. But it was completely absorbing and I was very happily lost in this imaginary landscape for the short time I had at the studio. When it was time to leave, I was pleased with the drawing, and here it is. This is the most recent of the set of little drawings I am working on. These are made from an old acrylic painting that I had started, but never finished. A few weeks ago, I cut it into nine equal pieces, and am transforming those pieces into small drawings. 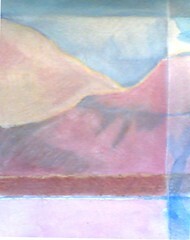 In this one, you can see part of the original painting because the mountain and sky in the largest rectangle have not been changed. But in the other areas, I drew lines with pencil and straightedge, and then used conte crayon to make something new, using the Colorado colors of the original painting. As predicted, we had quite a snowstorm over the past few days, probably the heaviest snow of the year so far. 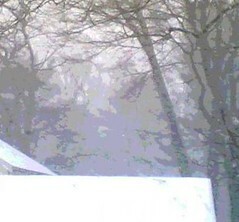 I tried to take some pictures with my phonecam as the heavy snow was falling. I cropped this image from one of those photos, and then posterized it. 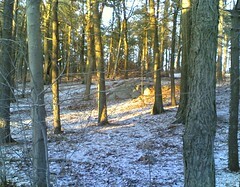 Today north of Boston, the landscape is covered with snow, slush, and ice. 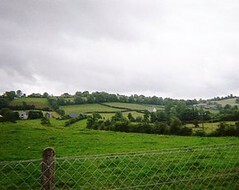 But it is March 17th, so here is a green landscape from the Emerald Isle. I came across this photo last night and cropped it to get the composition right, and I wanted to include the view looking across the fence. I know I took this picture during my trip a few summers ago, but I am not sure exactly where. It could have been on the road from Belfast to Dublin, or from Belfast to Galway. Lots of places there look a lot like this photo. Everywhere I went, the countryside was beautiful and everywhere the people I met said, "You are very welcome here." Yesterday my daughter and I took a short trip to Boston to see a show at the Museum of Fine Arts. She drove, so I got to be a passenger, which gave me the chance to take pictures on the way in and out of Boston. 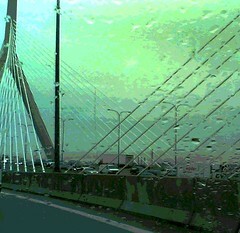 I love the Zakim Bridge, so even though it was raining and the car was moving, I took some pictures with my phonecam. I liked the patterns of the raindrops on the car windows against the lines of the bridge. Tonight I cropped the image for composition, and then decided to try posterizing it. I liked the result, and here it is. Yesterday we went to Long Hill Gardens for a walk. Although the weather was warm, the sky was gray and so was the landscape. 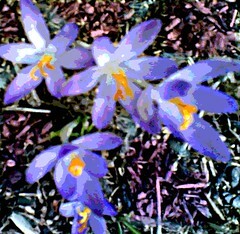 But I spotted these crocuses so I took a picture. Last night, I posterized the image, and then added some color to the background with digital pastel and color overlays. I decided that I had better post this tonight, because we are supposed to get a snowstorm tomorrow. This is the second small "transformational drawing" that I worked on yesterday at Red Brick. The red sun and everything else in that rectangle at the top are pretty much as they were in the original acrylic painting (cut into nine pieces to make these drawings). First I added the horizontal and vertical pencil lines. 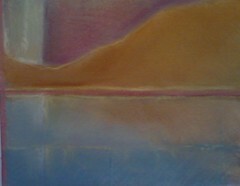 Then I used conte crayon to draw in the line for the shape of the mountain. Then I drew into the shapes with conte crayon to get the colors I wanted. Today I went to Red Brick and spent the time working on my series of small "transformational drawings." Here is one of the drawings I worked on today. 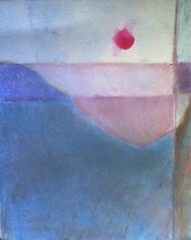 In this one, much of the image comes from the original acrylic painting. The mountain in the large rectangle is really untouched. I added the horizontal and vertical lines with pencil and straight edge, and then began to draw into those areas with conte crayon. I am trying to derive most of my colors from the original painting, and those colors all remind me of the Colorado landscape. 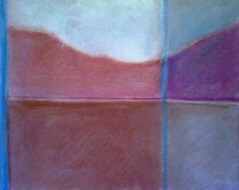 Here is another transformational landscape, drawn in conte crayon and pencil over a piece of a cut up acrylic painting. I finished this drawing yesterday at Red Brick, the second one I have done in this series. These drawings are not numbered in the order in which I am drawing them, but instead are numbered according to the position of the piece of paper in the acrylic painting. It is a lot of fun to do these little drawings. This is the first "transformational drawing" of the second set. 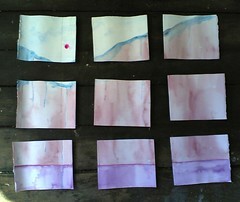 (These are nine small landscapes drawn on an old acrylic painting of mine, cut into nine pieces.) For this drawing, I started with the original composition, then added more pencil lines with a straight edge. 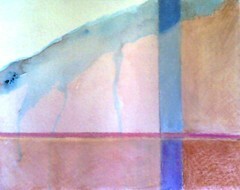 Then I start drawing into the image with conte crayon, letting the marks of the original acrylic paint suggest shapes. I also began with the color scheme of the original piece, but then intensified and added colors as well. I started this drawing on Friday, but have changed it twice since then, once to modify the shapes, and once to change the color scheme. Now I am happier with it. Yesterday I cut up an acrylic painting that I had started long ago and abandoned. I am going to make a set of small drawings out of it. I cut it into nine pieces, using a T-square. Whatever composition is already in each piece will be the starting point for the composition when I draw into each piece with conte crayon and pencil. A few weeks ago, I found this old painting that I had started some time ago but did not finish. I brought it to my studio at Red Brick with the idea of cutting it up to make another set of small drawings with conte crayon and pencil. (I call them transformational drawings because I am making drawings out of a painting, and changing one image into nine new ones.) When I went to Red Brick today, I got the project started. This time I remembered to take a picture of the painting before I cut it up, and here it is. Here is another posterized photo. 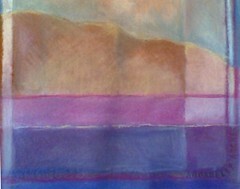 This one began as a photo that I took while my friend was driving toward downtown La Jolla. It was a wonderful day and La Jolla was amazing! I loved the palm trees and the bright pink flowers, so I tried to get a picture, even though the flowers were on the other side of the street and the car was moving. In the original photo, there is a good deal of traffic, windshield, and asphalt. 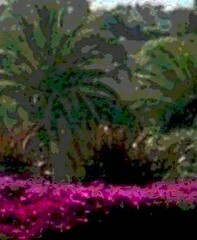 But I cropped this image out of that photo to focus attention on the flowers and the palm trees. Then I opened the image in Painter IX and posterized it. I like the effect, so here it is. 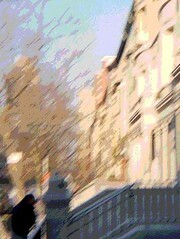 This image began as a failed photograph, taken during my recent trip to New York City. I was trying to take a picture of a New York side street, and tripped or moved, so I got a photo of a bunch of scaffolding, with a small bit of the street in one corner of the image, and somewhat out of focus at that. But sometimes it is fun to try to rescue or transform a photograph, and I certainly had nothing much to lose in this case. So last night I cropped the image, eliminating the scaffolding. Then I decided to posterize the image because sometimes that creates interesting effects when a photo has a soft focus. 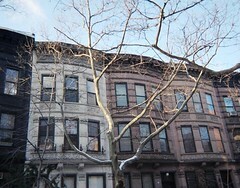 At the end of January, I took a quick trip to New York City to visit family. I didn't have a chance to take many pictures, but I recently found this picture of Manhattan townhouses when I picked up my photos of San Diego (I finished the roll of film on my trip to California two weeks later). This is one of the pictures I took on an early morning walk with my cousin. Tonight I cropped the image just a bit to get the composition I wanted. Late this afternoon, we had a snowsquall, almost a whiteout. Then the sun came out while it was still snowing! It became very windy and cold as the sky cleared. When the snow had stopped, my daughter pointed out that there was still time to fit in a short walk with the dog. On our walk, we passed a wooded area. 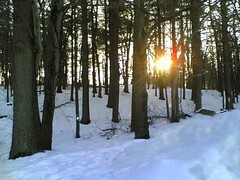 I liked the way the long rays of the sun hit the trees so I took a picture with my phonecam and here it is. This is a photograph I took in Porto during my first trip to Portugal. I love driving in the narrow little streets of the Foz. This photograph was the basis for one of my watercolors of Portugal that is now on display in Salem, but I also like it for its own sake. I thought of this image today because of a conversation at the reception about the colors in those paintings. 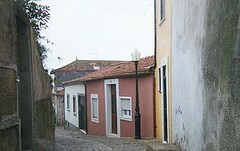 Watercolor is great for painting the subtle colors of Porto, which is sometimes overcast or foggy. In my watercolors, I start with the naturalistic colors in my photographs, but then I intensify them just a bit, to reflect the excitement of the trip itself. I have been looking at my pictures of San Diego. I am going through them because I am getting them ready to send to my friends. Tonight I started by e-mailing some of the pictures I took with my phonecam. 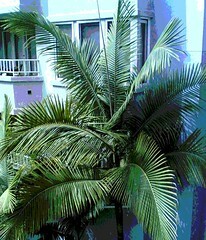 Just for fun, I decided to also try to posterize this photo of a palm tree in the courtyard. Here north of Boston, we have had sleet and rain, but just last week I was in San Diego, visiting with friends from Brazil! 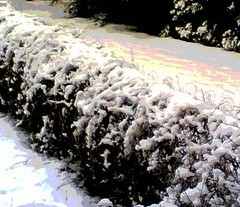 This is a photo that I took with my phonecam on my first morning there. 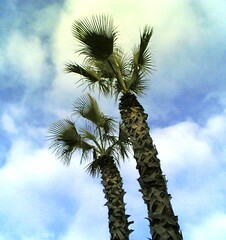 I loved the palm trees against the blue sky! Tonight I cropped the image to get the composition I wanted, and played with the contrast to make sure that the pattern on the tree trunks is easy to see. Three days is a short time to spend with such good friends! But I learned a long time ago that it doesn't matter how long the trip is; what matters is the length of time that you keep the trip (and the friends) in your heart. I made this image today to say thank you to a cousin who really deserves roses all around. 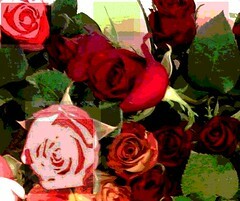 This began as one of several photographs of grocery store roses that I took on February 14th with my phonecam. Today I cropped this image out of the photo, and posterized it in Painter IX. Then I tried used dye overlays within selected areas, which created transparent squares of different colors. I liked the effect, and it was fun to discover something new.